Galaxy Thermoplast Pvt. Ltd. is an actively engaged producer, exporter and distributor of PFA Lined Reducing Flanges. We take special care in understanding the client’s needs and choosing the right material for any product offered to them. SS 304 PFA Lined Reducing Flanges are precisely manufactured using the best quality of raw materials as well as advanced technology under the guidance of the professionals at Galaxy Thermoplast Pvt. Ltd. MS SS 316 FEP Lined Reducing Flanges are required when there is a change in the pipe size. MS PTFE Lined Reducing Flanges are produced with high-grade materials that are sourced from the famous vendors of the market to assure the customers of the product durability. Manufacturer of Comprehensive Range PTFE Line Reducing Flange, Perfluoroalkoxy Lined Reducing Flange, SS 304 PTFE Lined Reducing Flange, PFA Lined Reducing Flanges, PTFE Lined Reducing Flange, SS 316 PTFE Lined Reducing Flange, High Quality PTFE Lined Reducing Flanges Supplier in Mumbai, India. 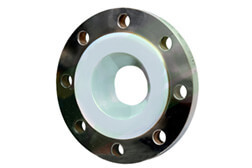 Largest Stockist of FEP Lined Piping Reducing Flange, PTFE Lined Equal Reducing Flange Price, PTFE Lined Reducing Flange Manufacturer, Polypropylene Lined Reducing Flange, PTFE Lined Stainless Steel Reducing Flange, Teflon PFA Lined Reducing Flange, Dealer & Distributor of PFA Lined Reducing Flange, MS Lined Reducing Flange in India. Using MS SS 316 FEP Lined Reducing Flanges is the most cost effective way to transact between pipes.MS SS 304 PFA Lined Reducing Flanges are a good alternative for connecting different diameters of pipes. 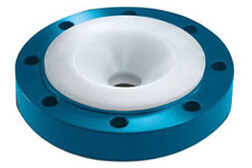 SS 316 PTFE Lined Reducing Flanges have dimensional accuracy and are easy to install. These PTFE/FEP/PFA Lined Reducing Flanges are available in variegated sizes and designs at a nominal price put forth by Galaxy Thermoplast Pvt. Ltd. 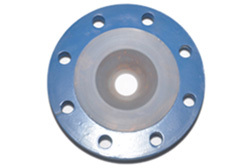 These flanges are tested against varied parameters. Galaxy Thermoplast Pvt. Ltd. is a trustworthy manufacturer. All dimensions are in mm otherwise specified & AS Per ANSI B1 6.9. 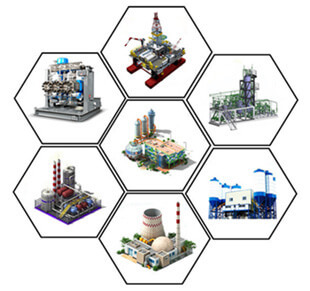 Flanges are drilled as per DIN, ASA, JIS or BS Standards as per individual customer's requirement. A) Reducers & Reducing flanges are from PTFE & as per Standard resin spec. ASTM D 1457 TYPE II & ASTM D-4894 & 5 type-II. B) Fabricated from Seamless Carbon Steel Pipe as per ASTM-A-106 Gr, B & Flanges confirms to ASTM A-105 OR IS 2062 OR Ductile Cast Iron confirms to ASTM A-395 or SG Iron confirms to ASTM A-536 (60-40-18). C) Reducers are being supplied with fixed flanges. 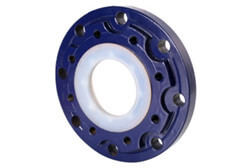 However it can be Supplied with loose Flanges as per individual customer's requirement. D) GTPL offers SS fittings as per individual customer's requirement . 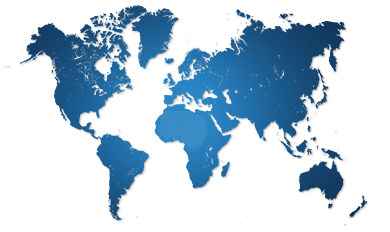 We are Experts in Exporting SS 304 PTFE Lined Reducing Flange in India, Austria, Azerbaijan, Zimbabwe, South Korea, Tibet, Trinidad & Tobago,Tunisia, Poland, Bahrain, Gabon, Bulgaria, Czech Republic, Kenya, Philippines, Oman, Slovakia, Argentina, United States, Bolivia, Nepal, Namibia, France, Venezuela, Sri Lanka, Taiwan, Puerto Rico, Nigeria, Netherlands, Nigeria, Saudi Arabia, Sweden, Hong Kong, Ghana, Israel, Bhutan, Pakistan, Australia, Japan, Peru, Russia, Iraq, Malaysia, Macau, Germany, Costa Rica, Mexico, Chile, Italy, Mexico, Iran, Iran, Turkey, Bangladesh, Estonia, Gambia, New Zealand, Thailand, Canada, Spain, Serbia, Hungary, Chile, Portugal, Denmark, Mongolia, Romania, United Kingdom, Vietnam, Norway, Switzerland, Ukraine, Qatar, Ireland, Lithuania, Algeria, Libya, South Africa, United Arab Emirates, Afghanistan, Kuwait, Croatia, Morocco, Colombia, Angola, Jordan, Ecuador, Brazil, Yemen, Belarus, Kazakhstan, Egypt, Poland, Singapore, Finland, Indonesia, Belgium, China, India, Lebanon, Greece. We are Experts in Suppling MS FEP Lined Reducing Flange in India, Pimpri-Chinchwad, Kuala Lumpur, Bhopal, Perth, Ranchi, Houston, Thiruvananthapuram, Seoul, Ankara, Howrah, Bengaluru, Chandigarh, Manama, Secunderabad, Busan, Ahmedabad, Hanoi, Montreal, Moscow, Dallas, Gurgaon, Santiago, Jeddah, Dubai, Vung Tau, Surat, Los Angeles, Madrid, Ludhiana, Hong Kong, Vadodara, Doha, La Victoria, Faridabad, Ho Chi Minh City, Geoje-si, Al Jubail, Al Khobar, Algiers, Kuwait City, London, Istanbul, Mexico City, Karachi, Lahore, Toronto, Ahvaz, Lagos, Noida, Visakhapatnam, Kanpur, Port-of-Spain, Bogota, Nashik, Jakarta, Rio de Janeiro, Bangkok, Haryana, Colombo, Tehran, Melbourne, Edmonton, Chiyoda, Nagpur, Jamshedpur, Jaipur, Petaling Jaya, Abu Dhabi, New Delhi, Rajkot, Atyrau, Cairo, Ulsan, Milan, Sydney, Thane, Gimhae-si, Caracas, Granada, Courbevoie, Aberdeen, Ernakulam, Navi Mumbai, Dammam, Kolkata, Baroda, Sharjah, Coimbatore, Muscat, Chennai, Riyadh, Hyderabad, Indore, Calgary, Singapore, New York, Pune, Brisbane, Mumbai.